NVMe is getting extremely popular. And, since the whole world is going crazy about this tech, it is high time to find out how to max out PCIe SSD utilization. 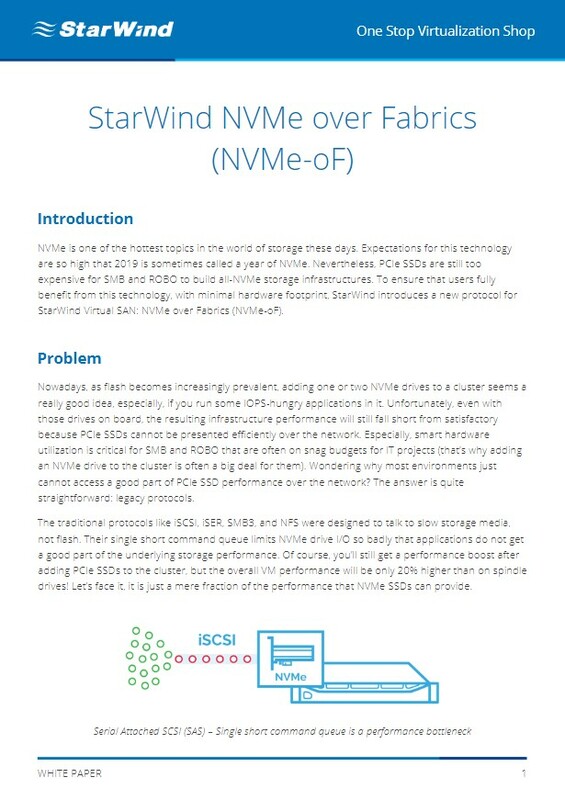 StarWind introduces NVMe-oF protocol support for StarWind Virtual SAN to ensure that you enjoy all NVMe benefits. Microsoft iSCSI Initiator does not balance virtualized workloads that good. It often overwhelms 2 CPU cores while others idle. 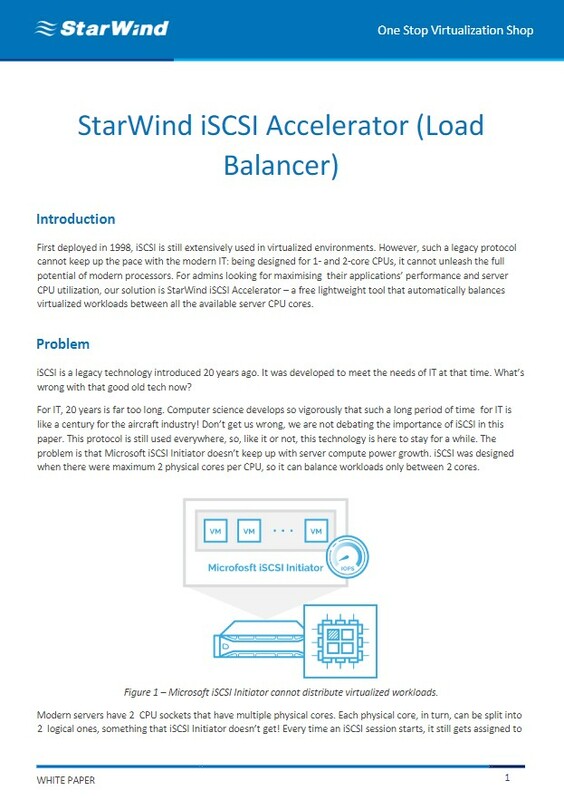 StarWind iSCSI Accelerator is a free product allowing to level workloads between all available CPU cores. StarWind Command Center is a single-pane-of-glass management and monitoring tool that provides complete visibility of the infrastructure state, monitors application performance, predicts and identifies possible pain points. It integrates the management of roles and components of a software-defined cluster within a single expanded and customized interface. StarWind Command Center is suitable for organization infrastructures with StarWind products or without them. 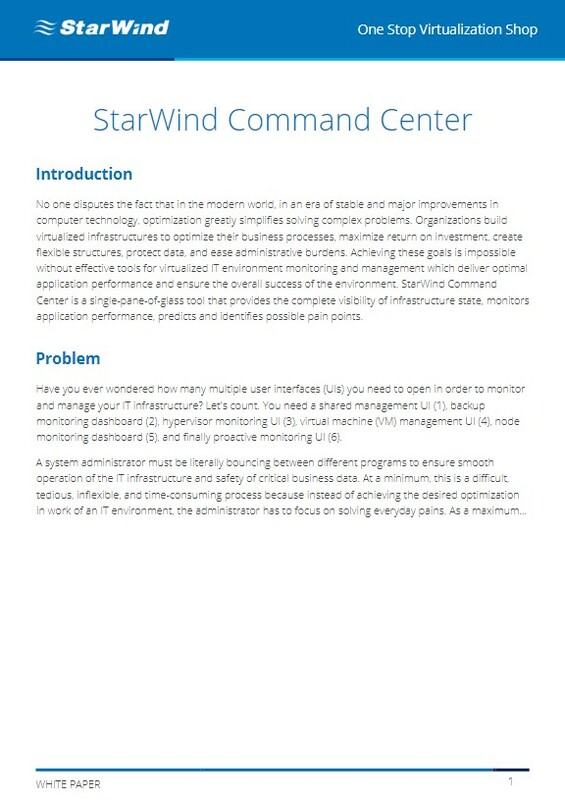 Find out from this document how to build a maximally reliable and efficient IT environment and achieve optimization of business processes with StarWind Command Center, without being distracted by multiple UIs. Traditional caching strategies cannot ensure consistent performance under intense virtualized workloads. 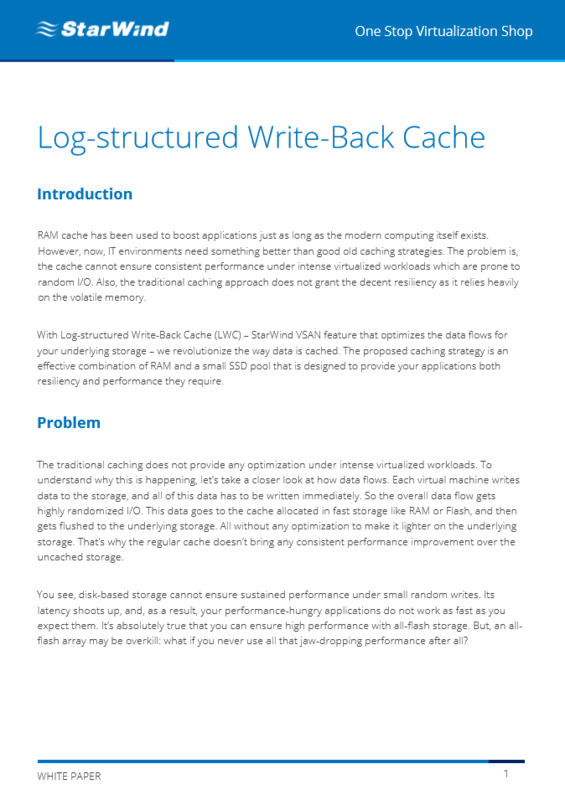 Learn from this whitepaper more about Log-structured Write-Back Cache (LSWBC), StarWind Virtual SAN feature allowing to ensure high applications performance and resiliency. 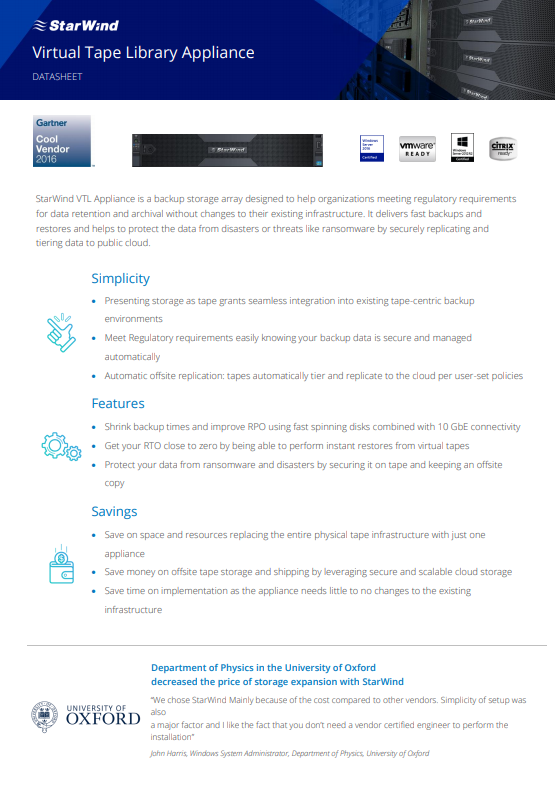 StarWind VTL Appliance is a backup storage array designed to help organizations meeting regulatory requirements for data retention and archival without changes to their existing infrastructure. It delivers fast backups and restores and helps to protect the data from disasters or threats like ransomware by securely replicating and tiering data to public cloud. 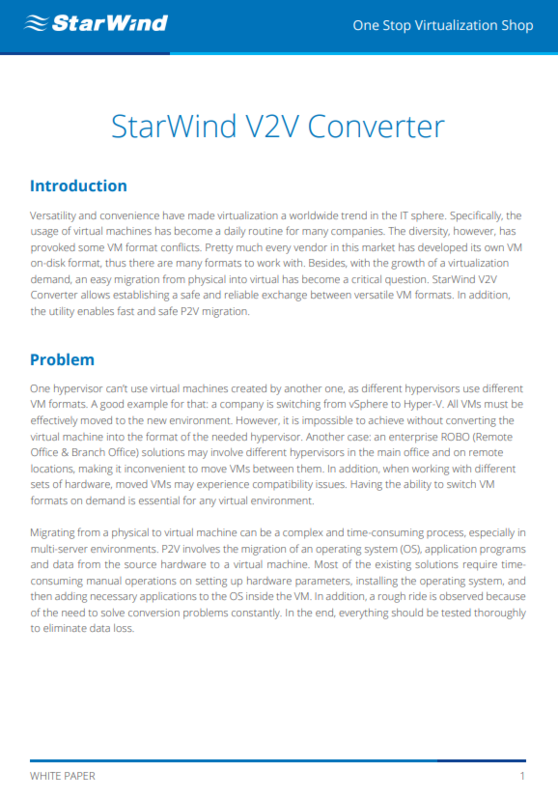 Convert a physical machine to VM (P2V), VM to VM (V2V) and work with VMDK, VHD/VHDX, QCOW2, and StarWind native IMG for free with StarWind V2V Converter!